A Celebration of the best vocal music around: show choirs, chamber choirs, a cappella, high school and beyond! Tickets can be purchased on line through Ticketstage.com. Click on the button above to be directed to their web site. 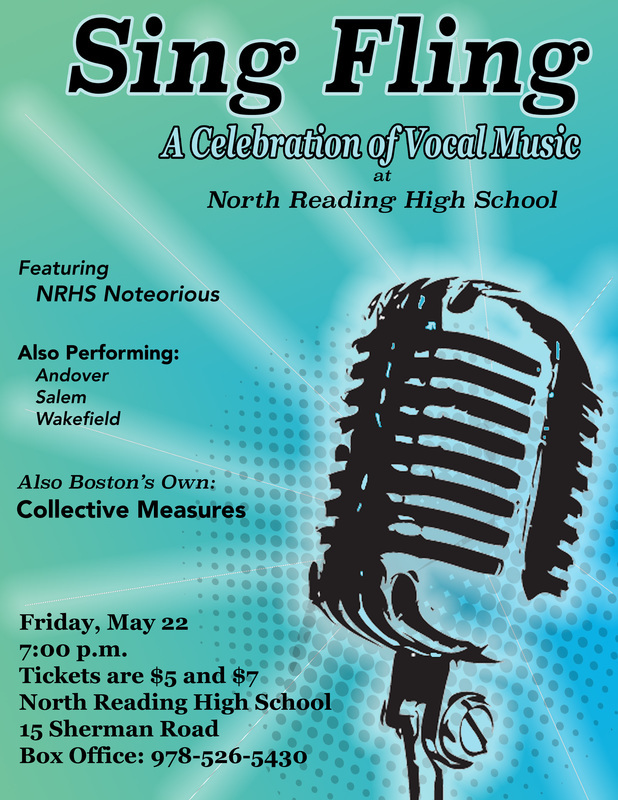 Tickets will be on sale in the NRHS boxoffice from 11:30-12:30 daily and starting at 4:00pm on Friday, May 22. The Box Office of the new North Reading High School (located in the main hallway "Main Street", past the gym and cafeteria and across from the media center). and in the rear of the theatre. Due to continued construction, parking will be tight, so please plan accordingly.The front door, located off of Oakdale and a right onto Sherman, is currently closed. The only entrance is through the main parking lot located behind the building. Additional parking spaces are available in the middle school parking lot at the bottom of the hill.